If you’ve got medium to long length hair then the possibilities for working fantastic styles and trends into your look are almost endless! 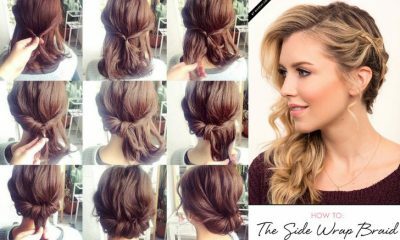 There are hundreds of fantastic hair tutorials which can whisk your hair up, transform it when it’s down or create gorgeous finished styles that can work for day or night time events. Here are some of our favourite hair tutorials for long and medium length hair which we think are absolutely gorgeous! This breathtaking curly side bun is the most perfect hair style for a special occasion; it’s feminine, flirty and fabulous – which is utterly perfect for that formal event! This lady has worked her wonderful hair into sections, creating a lovely side bun from the bottom layer. She’s twisted and curled the top section to pin it and make the most glorious finish full of ringlets. This glorious mermaid braid is simply stunning – it’s the perfect princess hair and we are so thankful there’s a tutorial so that you lovely long haired ladies can copy this gorgeous look! 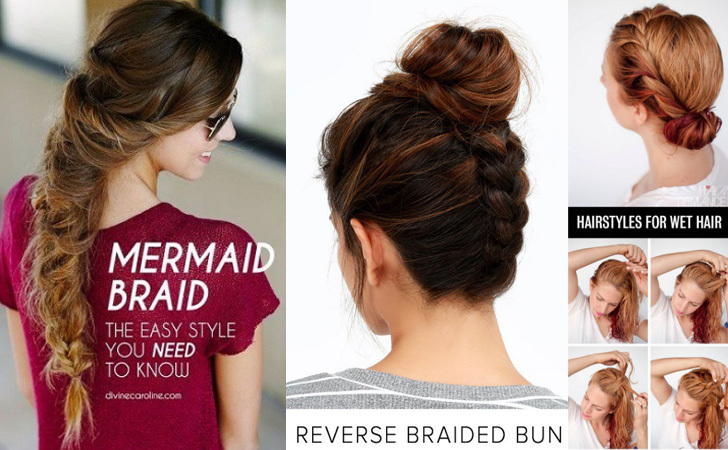 Starting with a simple french braid from the front to the back of the head, you then work the rest of the hair into this gorgeous and chunky braid to create the perfect mermaid finish. A french braid typically sits on the top of the head, but this remarkably stylish lady has flipped the look on its head and opted for a reverse french braid which works its way into a stunning bun on the top of her head – and we absolutely adore it! She’s gone for a traditional french braid from the bottom of the head, and swept the remaining hair into a lovely looking bun! This lovely loose braided up do is the most gorgeous style – especially for a bride to be! This romantic look has captured the hearts of the Styles Weekly office – and we just know that you will love it too! This lovely lady has curled and pinned the majority of the hair in a fabulous loose bun, and then braided the side sections into plaits and tied them around the bun. Leaving some strands loose finishes the look to perfection. This lady has worked her utterly gorgeous copper hair into the most perfect bohemian side braid which is utterly perfect for a festival braid. Starting from the fringe section, this lady has worked a fabulous fishtail braid along one side, and then twisted the other side into a matching braid, meeting the two together to form this gorgeous side plait style. This absolutely beautiful blonde hair has been swept into the most beautiful twisted crown to create a half up half down style that looks absolutely gorgeous. This look is fantastically simple to achieve but the results are utterly impeccable. The two sections on either side have been twirled into a lovely braid which is then pinned in the centre. This incredible pull through braid creates a striking finish for long hair, and with this impeccable hair tutorial you can recreate this gorgeous look on your own hair! Start with a high ponytail and then plait your hair for a little, fasten it with a hair tie, and repeat until the ends of the hair. Then pull loose the plaited section for the fabulous finished effect. This edgy fishtail half up look is just perfect for creating the bohemian style that is so on trend lately. This lady’s lovely blonde hair is finished to meet the latest fashion craze and we just can’t get enough of it! She’s swept half of her hair into a high ponytail and then worked the hair into a fishtail braid, pulling the sections loose for this amazing rugged look. This stunning half up faux-hawk is incredibly fashionable and stylish – and with this fabulous tutorial it’s actually pretty easy to achieve too! This lady’s beautiful blonde hair has been split into sections for half of the head, with the top middle section worked into a gorgeous french braid that runs from the front to the back of the head in a cool ponytail. This lady’s stunning hairstyle perfectly shows off her gorgeous copper to red ombre transition that we just can’t get enough of. 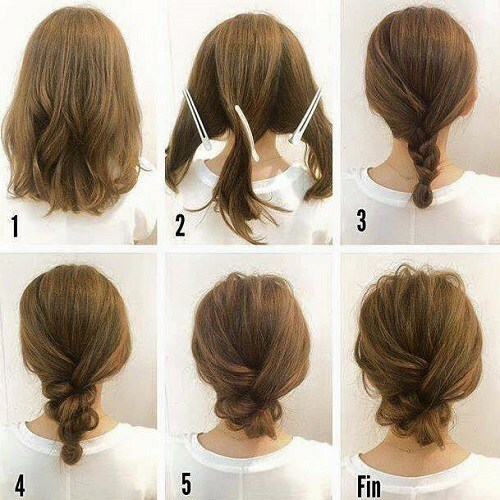 She’s worked this look with wet hair, sweeping the front section of the hair into a french braid, working down one side until half of the hair is tightly pulled together. She’s finished the look off with a low bun which looks stunning! This lady’s stunning red hair is full of volume and gorgeous curls, and she’s chosen the most wonderful ponytail to show it off – which is easily achievable for you too! She’s started by curling her hair and split the hair into three sections. The middle section is worked into a ponytail, and both side sections are twisted and wrapped around the ponytail to create this stunning voluminous look. This beautiful blonde Dutch braid is the perfect way of sweeping your hair off your face whilst maintaining a gorgeous and stylish finish too! This lady has braided either side of her hair and finished the look with a beautiful pinned section to create a fabulous halo effect that we can’t get enough of. This look is perfect for a wedding or a formal event. This fabulous bun look is the most gorgeous casual style for mid or long length hair, that we absolutely adore. She’s taken the length of her hair and twisted it tightly, before sweeping it up into a beautiful bun which she’s wrapped around and pinned into place securely. She’s loosely pulled some sections out to create a wonderful and relaxed finish that we can’t get enough of. This simply incredible messy crossover pony is a gorgeous way of turning your fabulous and standard ponytail into a wonderful fashion statement that will ensure you stand out from the crowds! Separate the hair into three sections and put the middle section into a standard low ponytail. You then wrap each side section of hair around the ponytail to create a beautiful twisted finish. The easiest way to create a gorgeous half up, half down style is to braid two sections of hair, one on either side of the head. This lady has gathered the two plaits, twisted them around each other and pinned them to create this gorgeous bohemian chic look. This style is perfect for festivals and an adorable day look – especially with the gorgeous colours working through this lady’s hair! This look is the most fabulously fashionable up do that is the perfect combination of smart and casual, making the most lovely style that we can’t get enough of. She’s loosely back combed the top of the hair to create a lovely finish, and then twisted the hair vertically to create a gorgeous twirled effect. Pin the twist loosely for this stunning effect that we just adore. It’s incredible what you can do with a braid – there are so many different ways to work them into your look and create a gorgeous finished effect; just like this fabulously fashionable lady has proved! She’s braided her mid length hair into a traditional plait, gently pulled the sections a little loosely and then tucked the plait under for a gorgeous finished effect. This lady has a simple stunning length of gorgeous hair which works for a stunning colour palette of blonde and brown tones with the most remarkable finish! She’s loosely swept her fabulous hair into a fantastic fishtail braid which falls down one shoulder and has pulled the sections loosely for this wonderfully swept braided finish. A fabulous half up half down style is easily achievable on mid length hair too – as this incredibly stylish lady has proved. She’s swept the back top layer of her hair into a wonderful beehive style by back combing it to create volume. She’s twisted the end sections and pinned it to create the most beautiful voluminous half up half down style perfect for day to night occasions. This absolutely gorgeous high crown braid tutorial will help you create the most strikingly beautiful up do that we absolutely can’t get enough of – and now you can copy it all on your own! Working from one side of the head to the other, she’s twisted her hair into an amazing french braid that creates a gorgeous crown when pinned together. Her Style Code hope that we’ve proved the opportunities for long and mid length hair are simply endless – you can create a gorgeous selection of beautiful hair styles from the comfort of your own home that will work for any occasion! Let us know which of these looks is your favourite, and we will bring you more hair inspiration every week!